I probably mentioned it already, but I’m very picky about the pens and pencils I use. In a pinch, I’ll use whatever’s available. But for regular use, I have preferences. Judging from the response to our Do You Have a Favorite Pen, Pencil, Marker, or Other Writing Tool post, I’m not alone in this. I’ve been using Staedler’s metal-bodied mechanical pencils for some time, and tend to like them a lot. I believe I started off with a 2.0 mm pencil before moving to 0.7 and 0.5 mm designs. A 2.0 mm pencil is more for drafting, with smaller sizes being better suited for writing and quick sketching. I like 2.0 mm pencils since there’s an easier variety of lead, more control in how you sharpen a point, and out of habit. They also offer 0.3 and 0.9 mm pencil sizes. 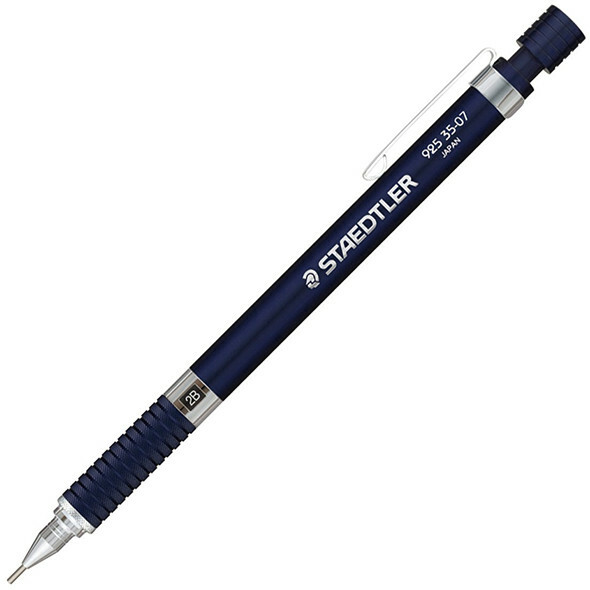 Staedtler makes these pencils with silver or blue finishes. Up to now I’ve been using the silver-styled ones, but I’ve been meaning to buy another 0.7 mm pencil and will go blue this time around. I don’t think that the “Night Blue” finish was available when I purchased my Staedtler mechanical pencils a few years ago. I use my pencils more for sketching out project plans, and not really for drawing. The grip is finely textured metal – the entire pencil body is made from metal (aluminum) – which I definitely like better than the gummy rubbery grips found on other designs. These pencils aren’t weighty, but they’re also not flimsy. They have the feeling of strength and good balance, but you don’t have that “chunk of metal” feel that you might or might not like from your pens and pencils. They’re fairly inexpensive, at ~$10 to $15 each. While I have pricier fountain pens that I love using (more on that another time if anyone’s interested), $15 is about the upper end of what I’m willing to spend on a mechanical pencil. A few years ago, I considered $7-10 to be a lot for a mechanical pencil. But then again, that’s talking about plastic-bodied office supply store pencils that I tended to break too easily. These Staedtlers are definitely built a lot better, and I think it’s fair to say that you do get 2x the quality for the 1.5x to 2x the price. P.S. Which pens or pencils should I look to try next? I received at least one email request in recent months, asking for more pen and pencil reviews. I’d be up for it. « Tools You Use Most Often? I just bought a Staedtler lead holder… so basically I have to sharpen the chunk of lead myself, but it allows me to bridge the gap between engineering documents and art. I havent had time to really get to use it, but I am very eager to get some free time now. Because of how it works, this one is more akin to a mechanical pencil than a lead holder. I know that, this is a mechanical, but I really wanted something that I could get artsy with… so hence why I bought a lead holder. Either way, they make a great product. Japan has the best writing tools, need to try some zebra products next. Staedtler is a German company, btw, although it does do some manufacturing in Japan (probably less than than 20%). I prefer the kind where the delicate final tube that supports the lead can be retracted into the body to protect it. I think I actually looked at a bunch of mechanical pencils at a local shop after that post. I think my favorite was a GraphGear of some type. I should go back there and get one. 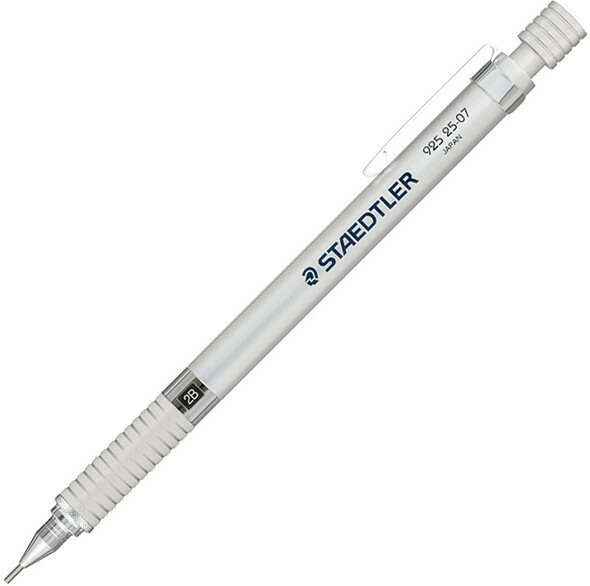 I have a Staedtler 0.7mm pencil that I’ve seemingly had forever but it would be nice to have another that I could leave in the shop or my office. Papermate PhD is the best mech pencil I’ve yet used. Smooth writing, comfortable shape, retractable tip, extendable eraser. Got a Kuru Toga autorotator a few days ago on the suggestion of a coworker but the fixed tip and pitiful little eraser pretty much trap it at my desk for the time being, however well it writes. My drafting pencil is an old Teledyne Post 39 M6-10 and I use a Keuffel & Esser (K&E) 1099 rotary pencil sharpener. Both Post and K&E (along with Pickett, Dietzgen and others) also made slide rules. Mine was a K&D Log-Log Deci-Trig made out of mahogany and ivory held in an orange leather case. My first TI 55 calculator obsoleted the old slip stick – but the K&E pencil sharpener survives. I like the older Pentel 0.7 mm lead pencils. I am too heavy handed to use 0.5 mm. I also have a real fondness for Cross pen and pencil sets. I love the Pentel Twist Erase 0.5mm pencils. Essentially disposable but mine are happily getting old. But more to the point of the post, I recently got a Rotring 600 as a gift, very nice. I think it’s in the same category as the Staedler mentioned here. I keep it on my desk – I’m sure I’ll stab myself if it’s in a pocket. All the keyboard work I do really makes my handwriting suffer, but using a pencil is as satisfying for me as others’ appreciation for fountain pens. I’m constantly losing pencils, so I pretty much get a bulk pack of whatever mechanical pencils are cheap and look like they would work. The OfficeMax generic ones are actually pretty good for the price. If I remember right I got a 10 or 12 pack for under $5. Their mechanical erasers are OK at best, though. The body is fine but the eraser itself is made out of a material that doesn’t erase as smoothly or as well as the Paper Mate erasers. For some reason, I rarely lose pens, so I got a $19 Fisher Space Pen, which is my favorite pen. Not for its smoothness or beauty so much as its ability to write on almost any surface, smudge free. It is also the only pen I found you can lose in your glovebox, find almost a year later, and the ink won’t be dried out. For functionality, not is hard to beat. Used a Pentel P209G for the longest time. Have used the Pentel Twist Erase 0.9mm the last few years for it’s thicker barrel and good eraser. I have a set of old Pentel mechanical pencil’s that I use – mostly because they were free to me. I keep probably 3 in the garage. if one were to break, I know where the spares are. I also keep 2 or so sharpie’s in the garage too. black and blue – the needle tip version. or whatever it’s called. ultra fine point? At work I keep a parker retractable ball point, I need to get a new Roller Ball Cartridge for my other pen. I know guys that have and use the fisher space pens. They swear by them and I like the idea – haven’t bit the bullet yet though. The Staedtler is nice, but it’s really pricey for a shop type pencil, that I will likely lose or break. I have had really good luck with the Pilot H-325 Drafting Mechanical Pencil, you can get 4 for $9 on Amazon, and they are a very similar design to the Staedtler, except they are plastic, but they are very robust for what they are. 0.3mm is very small why did I get that? 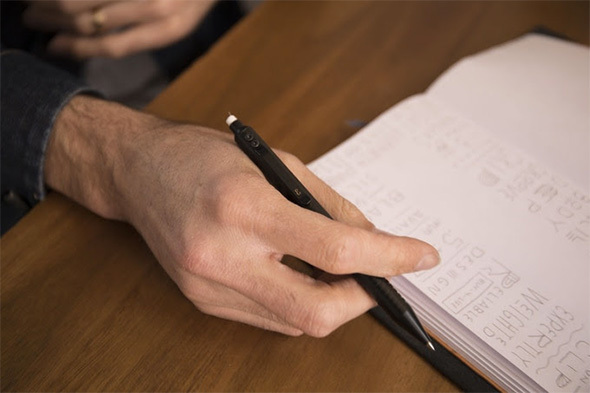 In college I used to take notes on college ruled paper and tried to use every inch of paper to avoid spending the ridiculous rates for copies…remember…poor college student days. I actually like 0.3 mm Hi-Tec and Slicci pens. They’re a bit scratchy and slow to write with, but that helps me slow down and write more legibly. Otherwise, with larger diameter pens, such as 0.7 mm gel pens, I write so quickly and sloppily that I can hardly read what I write. Sometimes, I look back at past writings, and cannot fully decipher them. 2.0 mm for drafting??? Brother, what planet are you from? When I went to college I majored in architectural drafting, we used .3, .5, .7, and on rare occasion, .9mm. Those were the only sizes available, as well as heard of. I have a few of each German and Japanese brand, in each size, with different lead densities (F’s and H’s) and even a few with colored lead. We used .5mm on most things. I’ve standardized on 0.5 mm for compatibility with the Incra precision rules (and equivalent knockoffs). I bought an Autopoint All-American in 0.9 mm after having won a ten pack of Autopoint pocket protectors on eBay. Couldn’t see putting one of my Pentel pencils in an Autopoint protector. (32 year old automotive engineer. I can tell you, pocket protectors didn’t go away because they aren’t functional. I’m the only one in the office that wears one, but four years in, I’m lost without it. I have Uni-Ball Onyx pens in three colors, a sharpie, a highlighter, a Pentel Sharplet 2.0 with red lead in 0.7, and my All-American with me at all times.). The Autopoint takes a bit of getting used to due to the twist grip, but I love everything about it, especially the eraser, which is the best on-pencil eraser I’ve ever used.